Bullet Shot: Alec Warren | The Gettysburgian. Despite the Bullets Men’s Basketball Team 53-75 loss against Haverford last Saturday, Senior Captain Alec Warren is optimistic about the team’s future. The Bullets started off strong, but began to fall behind after the first quarter. With an impressive 65.1% shooting average, the Fords soon gained a clear lead over the Bullets. 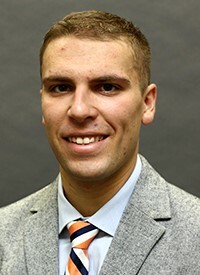 Senior and Captain Alec Warren, hailing from Shawnee High School in Medford, New Jersey, scored 8 points for the Bullets and added 2 boards.